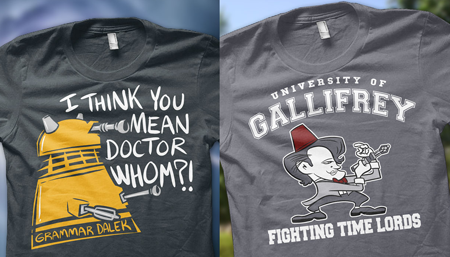 There’s more new shirt news HERE including a NEW FIGHTING TIME LORDS SHIRT! A good preorder means I will get to take these new shirts to cons! 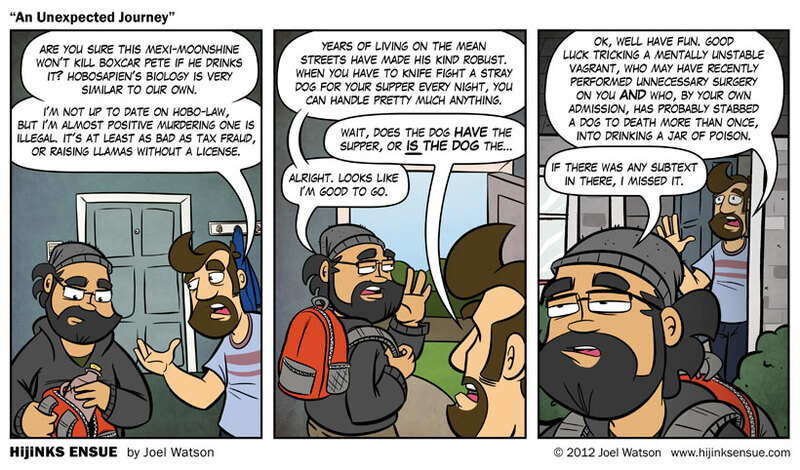 Check out my friend Sam’s massive SDCC Jam Comic, to which I contributed a panel. So finally, Eli is out of the house and off to seek out Boxcar Pete. I’m finding that when writing storylines 3 panels at a time and only every other day or so, it takes a REALLY long time to get things moving. A couple of minutes of conversation can take more than a week’s worth of comics to get out. I am very much in the “figuring this out as I go along” category with regards to these story lines. 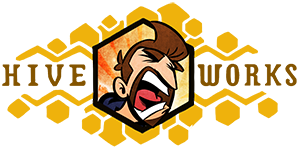 It’s like that thing where you are having fun, but also terrified? The Batman ride at Six Flags? Yes. It is like the Batman ride. Especially because sometimes everything runs in reverse with no warning and something is cackling maniacally in the distance, then you throw up. That metaphor works for pretty much everything. COMMENTERS: Do you have any stories to share about setting out on an adventure on your own? When I was 17 I drove up to Dallas from SE Texas to visit some friends for a week. During that time I met a girl, and decided to move 300 miles away from my family so we could maybe date or whatever. Thirteen years later we are quite married, intensely not tired of each other and entirely parents to a wonderful and ridiculously intelligent little girl. Sometimes you just have to shut your eyes and leap. Posted in Uncategorized and tagged hoboes, moonshine. Ah, I can combine such a story with a European version of Boxcar Pete. When in the Air Force I took the opportunity to take a hop–well several hops–via military aircraft to Germany and then trained down to Salzburg, Austria to visit a brother going to school there. I immensely enjoyed wandering through the old parts of the city. One day while trying to get some spectacular morning photos on the grounds of an old fortress, I was taken aback by coming face to face with a disheveled, slightly grizzled but youngish homeless man. "Wie viel Uhr ist es?" he asked ("What time is it?"). I was able to stammer out a reasonable reply in my rusty German, he thanked me for it, and merrily proceeded on to whatever business awaited him. All in all it was one of the best trips in my life. I think telling the time is the hardest part of learning German. It's kind of irrational. We are moving to Germany this year and my wife is practicing "Entschuldigung, aber ich habe keine Uhr" (Sorry, I don't have a watch). Yeah, I can agree. I hated it when we were on that part in class, and rather relieved once we got past it. I'm writing a novel! This, too, is like the batman ride. Also, even in novel format, it takes FOREVER to get people out the door. My guy has been driving in a van for two and a half chapters. It's something I need to work on. In the last frame, it looks like Eli has a pony tail beard! Your mind is much less dirty than mine it seems. I see… see something different. And now that you have said that, I can't unsee it. I really hope this ends with a Princess Bride Dread Pirate Roberts Poison scene against the hobo over moonshine. Inconceivable! Hitchhiked one time through Sioux Falls, SD. Can you believe there's THREE homeless shelters within walking distance of each other? I met this one guy who looked like Shaquille O'Neille. He had hidden a bottle of whiskey in the park since alcohol wasn't allowed at the shelter. For some reason he invited me to drink it with him, and we sat by a small waterfall slugging it back. Then for some reason we threw rocks at a television someone had dumped there. 1990. Graduated college in Tulsa. Packed up my stuff and moved to the Detroit area. Not terribly exciting to consider now, but given that I really didn't know *ANYONE* there and it was my first time setting out on my own for real, it really had that whole "without a net" feeling to it. And I learned quickly how much that "great starting salary" (MORE MONEY THAN I'VE EVER MADE BEFORE!!!1!!eleven!) didn't go very far once you started paying real rent (to someone not your parents), utilities, food, clothing, car insurance, and were now in a tax bracket you'd really never knew existed before. In late 2008, I packed it all up and moved to Houston. Older, theoretically wiser, but still wading into a new city I didn't know, an industry totally different from the one where I'd spent the previous 18 years, and I hardly knew anyone here (thank you, internet. You made it so I didn't go in COMPLETELY cold). That stepping-off-the-cliff thing all over again, hoping the cleverly-disguised but still scary-looking bridge (WHERE THE HELL ARE THE HANDRAILS???) is there when I leap from the lion's head. Each time I've had to do this, I've always been happy I did. We just uprooted ourselves (and our kittehs) from our house and friends in Maryland and moved across the country to California so my husband Alex can work on projects he enjoys, rather than working for the government (something that ultimately happens when you live so close to DC). It's a little insane, especially since we have no jobs here (yet), only found a place to live 6 weeks ago (we've been here 3 weeks so far), and really don't know what the future has to hold. But it's pretty exciting thus far! He's started work on his own web comic, and I'm starting a blog. (We met you on JCCC2, btw; hope to see you again on the next one). Well, at least Eli is outside. Christmas Eve day, 2007. I was in California, far from midwestern family, so I drove to Mendicino in a rented car. I decided to explore a small redwood state park roughly 28 miles from civilization in either direction (Montgomery Woods). Three miles into the *extremely satisfying* race-track, curvy drive, I came upon a hitchhiker. WTF? What was he doing out here? But it was Christmas Eve Day and he uh…looked harmless. He was grateful for the ride. Said his car broke down and he wasn't eager to walk all the way to the uh…you know…uh…where he lived. (We were headed *into* the forest, not toward a town. Anyway, we drove together and chatted for about ten miles and then he said, "Here is good." We were in the middle of forest in every direction. "Here?" I said. "Are you sure?" He hopped out of the car and disappeared into the woods. Doesn't sound it to me. But then, I live out bush in the middle of nowhere, and am used to people assuming that no one in hell lives where I live. People just apparently can't see the track that leads to our house, and can't see the road that leads to our track. Possibly because it's not in GPS country, but instead beyond the Black Stump. Sometimes it's because you don't have the eyes to see what the local is seeing. The boyfriend met me very similarly. I knew him through a community online and he lived about 3 hours away. I was having a terrible week and he said he’d come down to visit me on the fly. About a year later he had moved here. We’re coming up on 7 years together this September. Seven years and no ring? No thanks. Im comfortable with the format. Boot camp. I learned a lot about myself, especially after the Navy told me I was too crazy for them. Then after wandering around Chicago for a few hours trying to figure out how to get to O'Hare, I was never happier than when I stepped off the plane in Portland. Of course, I'd be lying if I said I wouldn't trade that for anything. Because I would. I would either have not let the Navy find out I was nuts and possibly still be in, or I wouldn't have gone to begin with. Holy cow I had an experience almost identical to your writing prompt! I spent a lot of time with a girl I met over the course of a couple visits to out-of-state family, and she finally said that maybe if I lived there instead of far away, there might be more between us. I did move out there, and she didn't even answer my phone calls. I literally never saw her again. It was awesome for my life, though, and I wouldn't have met my wife otherwise. Also my wife is awesomer than that girl, who I believe is currently alcoholic in Brazil.